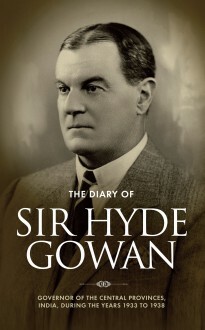 Sir Hyde Clarenden Gowan was born to a prestigious English family and in 1902 he entered the Indian Civil Service to embark upon a career in an exotic new country. Sir Hyde rose from the position of under-secretary to become an important figure of the British Empire. Sir Hyde spent his entire thirty-six year career in the Central Provinces and Berar, becoming Governor in 1933. Despite living for decades in India, he always felt like an alien abroad and often called it an “Ulta pulta desh”: an upside-down-country. Sir Hyde held the post of Governor during one of the most turbulent periods of Indian history. Tensions between Muslim and Hindu groups divided the country whilst nationalists such as Mahatma Gandhi fought for India’s independence from Britain. During this time, the Government of India Act of 1935 was passed forever changing the face of Indian society and the role of governors in the country. When Sir Hyde died suddenly in 1938, he was mourned by the British and Indians alike, having been much loved for his steadfast dedication to his duties. His family received condolences from King George VI and other members of the Royal Family. With an introduction by his son, James Hyde Bowie Gowan, Sir Hyde’s diaries are here reprinted in their entirety alongside some of his speeches. The diaries reveal the great man behind the Governor, the delights and difficulties of his position and an insight into Indian history and life never to be repeated.